This exciting new book opens a window into the causes of debilitating neurological disorders such as Parkinson’s disease, CJD and Huntington’s disease, and gives indications of the prospects for therapy, based on the understanding of molecular defects involved in these diseases. 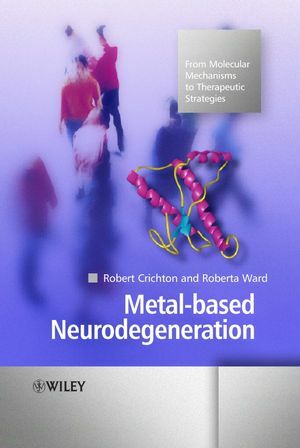 Looking at each specific neurological disorder in turn, the book outlines the role of metals in human biology, in particular in the brain and explores tools for testing potential therapeutic strategies. It concludes with an overview of the potential of both chelation and antioxidant therapy and outlines some perspectives for the future. Professor Robert R. Crichton, Unité de Biochimie, Belgium. Professor Roberta J. Ward, Unité de Biochimie, Belgium. 1 Metals in Brain, Metal Transport, Storage and Homeostasis. 1.1 Introduction – the importance of metal ions in brain function. 1.2 Metal ion transport and storage – iron. 1.3 Metal ion transport and storage – copper. 1.4 Metal ion transport and storage – zinc. 1.5 Metal ion transport and storage – other metals. 1.6 Metals and their homeostasis (with particular reference to iron and copper). 2 Oxidative Stress and Redox-Active Metal Ions. 2.1 Introduction – the oxygen paradox. 2.2 Reactive oxygen species (ROS). 2.3 Reactive nitrogen species (RNS). 2.4 The targets of ROS and RNS. 2.5 Cytoprotection against oxidative damage. 2.6 Mitochondria, free radicals and signalling. 2.8 Apoptosis – programmed cell death. 2.9 ROS, RNS and signal transduction. 2.10 Molecules involved in the inflammatory pathway. 3.1 Proteins involved in Parkinson’s disease. 3.2 Metal involvement in Parkinson’s disease. 3.3 Risk factors for Parkinson’s disease. 3.5 Role of dopamine in Parkinson’s disease. 4.1 Proteins involved in Alzheimer’s disease. 4.2 Metal involvement in Alzheimer’s disease. 4.3 Genetic and risk factors. 4.4 Mitochondrial function in Alzheimer’s disease. 4.6 Role of acetyl choline in Alzheimer’s disease. 5 Huntington’s Disease and Polyglutamine Expansion Neurodegenerative Diseases. 5.1 Introduction – an overview of trinucleotide expansion diseases. 5.3 Structural models of polyQ protein aggregation. 5.4 Mechanisms of cell death in polyQ diseases. 5.6 Other polyQ disease proteins. 6 Friedreich’s Ataxia and Diseases Associated with Expansion of Non-Coding Triplets. 6.1 Incidence and patholophysiology of Friedreich’s ataxia. 6.2 Molecular basis of the disease – triplet repeat expansions. 6.3 Molecular basis of the disease – frataxin and its role in iron metabolism. 6.4 Other diseases associated with expansion of non-coding triplets. 7 Creutzfeldt-Jakob and Other Prion Diseases. 7.2 A brief history of prion diseases. 7.3 The ‘prion’ of ‘protein-only’ hypothesis and conformation-based prion inheritance. 7.4 Mechanisms of conformation-based prion transmission. 7.5 Pathways of prion pathogenesis. 8.2 Major genes involved in ALS. 8.3 Superoxide dismutase and ALS. 8.4 Contributors to disease mechanisms in ALS. 8.5 Other pathways that may cause damage to motor neurons. 9.3 Wilson’s and Menkes diseases. 10 Therapeutic Strategies to Combat the Onset and Progression of Neurodegenerative Diseases. 10.3 Huntington’s disease and other polyQ disorders. 10.4 Friedreich’s ataxia and other diseases linked to non-coding triplet repeats. 10.6 Amyotrophic lateral sclerosis, ALS. 10.11 Future direction for therapeutic agents. 11 Animal Models of the Various Neurodegenerative Diseases. 11.1 Parkinson’s disease animal models. 11.3 Huntington’s disease and polyQ. 11.6 Amyotrophic lateral sclerosis, ALS.